For the last week or so I've been concentrating on testing out recipes that allow me to pickle or preserve some of my favorite things one jar at a time. My latest attempt was a recipe for sweet pickle relish I found online at food.com. It has got to be my favorite "one jar" recipe. 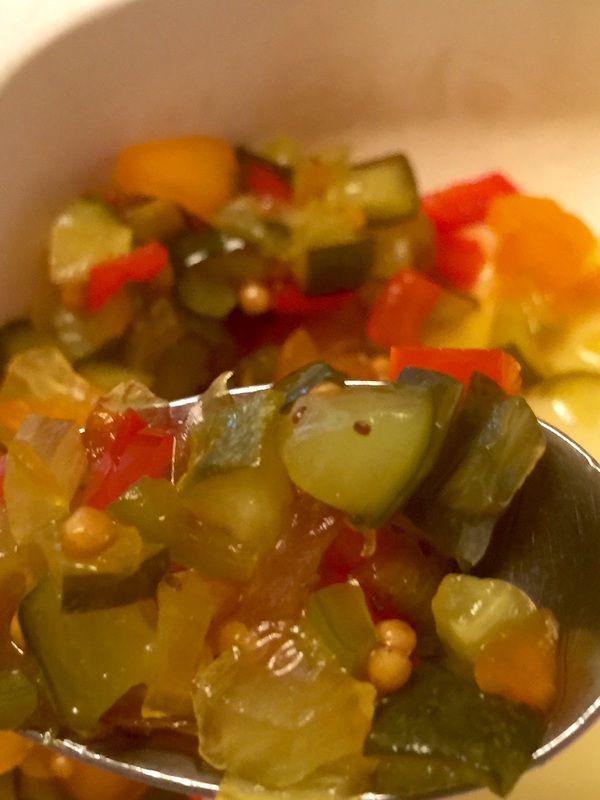 This makes one pint of the most wonderful homemade relish you will have tasted anywhere. I dare you to go back to store bought brands. Toss the chopped vegetables in a large glass bowl with the salt. Cover with water, then cover the bowl and allow it to sit for 2 hours. Drain water and rinse the vegetables off in a strainer. In a large pot, combine the sugar, vinegar, mustard seeds, celery seeds and turmeric and bring to a boil, stirring frequently to help dissolve the sugar. Add the vegetables to the sugar mixture, and bring to another boil. Reduce the heat to a low boil and allow the liquid to reduce for about 10 minutes. There should be very little liquid remaining. Spoon the hot pickle relish into a sterilized jar, and seal with a new lid and ring that have also been sterilized.